I am sure many of you reading this are concerned about the current condition and crisis in Japan. The eyes of the world are watching, as the tragedy and drama of real lives unfolds. Often in my explanations of places and happenings I discuss Japan`s geography and reference certain areas and fault lines. We live in Chiba (4) close to Tokyo. This area is considered to be east Japan, and also is referred to as Kanto. The area north is called Tohoku. (North eastern Japan) It includes the heavily damaged areas of 16, 24, 8. Also 3 and 14 experienced major earthquakes. However, other earthquakes have been originating in both Chiba (4) and Shizuoka (38) Also Niigata (29)has had some major earthquakes since March 12. The best way to put it, is like popcorn in the popper, when the large Pacific plate moved it sparked activity in multiple areas. These are not aftershocks but additional earthquakes resulting from the heat and pressure of that movement. It`s almost random and very hard to predict for the Japanese experts at the moment. 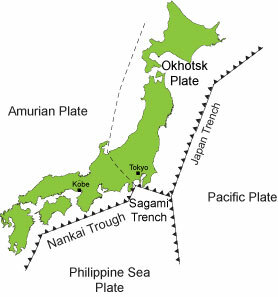 The earthquake that would cause the most damage and loss of human life would be a large earthquake along the Toukai (east ocean) plate which is an extension of the Nankai (southern ocean). As you can see Chiba is directly above the Sagami trench, the trigger point for an earthquake that would hit Tokyo bay directly, potentially causing the eruption of Mt. Fuji. These are just the basics, but I think it will help ground some of the information that many of you are getting as well as any information I am giving to you. Historically Japan has been hit with disastrous earthquakes many times, each time causing the people to once again restart and rebuild their civilization. Thus you can see the effect such an environment has on the people, traditions, and language, I mean TSUNAMI is their word! That just shows you how ingrained the situation is to them. Once again Japan may have to rebuild itself as a nation, it`s population at great risk as the days and weeks unfold, but in a way the catastrophe is inspiring many, perhaps changing a lost generation to find its path. The young adult to mid 30 age generation in Japan has been given the label the "Lost Generation" by media and popular culture. Let us pray that they become "found" or find themselves in the midst of all this chaos. And that Japan emerges stronger and better than ever. Please continue to pray for the comfort and healing of many and the strength for those fighting for lives daily! Thanks, Stephen, for this comprehensive and informative post. Once again, wishing you, your family and all the Japanese people peace and recovery in the days ahead. Good job bro! Way to give people the facts of what's going on. Remember, you conquer your fear through knowledge to combat it. This is great and informative. It really puts what is going on in Japan in perspective. Keep well. Wishing you and your family, and anybody else affected by the quake lots of love, recovery and *hope*.